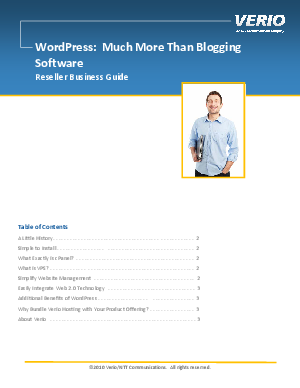 BizReport : Research Library : Verio Inc.
WordPress provides a versatile platform for everything your customers demand and is quickly becoming the industry standard for creating easy-to-manage websites that perform a variety of tasks to support online business. Download this guide for videos and demonstrations that show how easy it is to install WordPress with a cPanel VPS hosting solution. Then dive into the ways WordPress can help streamline application and website development with its low-tech interface and available plugins.